Head-to-head in radical opposition, man and bull, the rational being and the brute. The former aims to order, to re-direct the animal's instinctive fierceness by the stratagems of art and beauty, enacting a metaphor of our own confrontation with death. 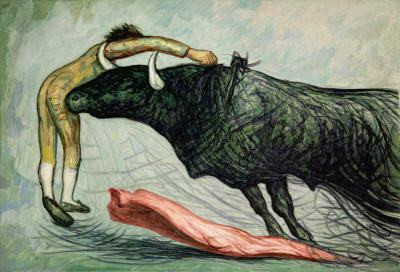 The bullfighter, then, represents the rationality that must govern all irrational impulse, represented by the bull. And his task is to dodge and avoid, with extreme skill and subtlety, that most irrational of attacks against our own nature – that of death itself. This is the essence of the bullfight. The language of disproportion is employed here once again. As in the case of Lassitude, the linear elements are given an expressive function and so, like lines of force in physics, these are used to form the body of the bull (and even the areas immediately surrounding it). The bullfighter seems no more than a rag doll next to the sheer physical power of the charging animal.